Afghan President Hamid Karzai has attended his first campaign rally outside the capital, Kabul, just four days before landmark elections. He flew to Ghazni, 100km south of Kabul to address a crowd of about 10,000. Two other leading presidential candidates also held rallies - Yunus Qanuni in Kabul and General Abdul Rashid Dostum in Mazar-e-Sharif. 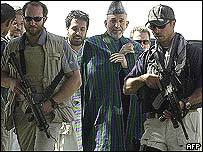 There was massive security for Mr Karzai - violence by the Taleban has hampered campaigning in many areas. Mr Karzai's only other campaign foray outside the capital last month was abandoned when a rocket was fired at his helicopter. The BBC's Andrew North in Ghazni says a lively crowd holding colourful banners and portraits of Mr Karzai gathered to hear him speak on Tuesday. He urged people to support him and help the country recover from decades of war. "Brothers and sisters, I ask you to vote for me freely, with no pressure. 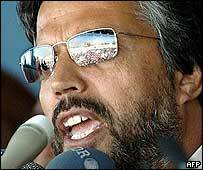 We want a proud Afghanistan, a stable Afghanistan, a peaceful Afghanistan," he told the crowd. His arrival was accompanied by massive security, with Apache attack helicopters and A-10 tank buster aircraft guarding the president's helicopter. After the rally, the president mingled with the crowd to the discomfort of his US guards. He shook hands with an old man, telling his guards: "Don't push him! Don't push him! This is democracy. This is emotion!" One of Mr Karzai's leading rivals, Mr Qanuni, told 2,000 people at a Kabul football stadium the election would be a "transition from dictatorship to democracy and elected government". He condemned the killing of one of his campaign organisers, Abdul Aziz, in Shindand, western Afghanistan. 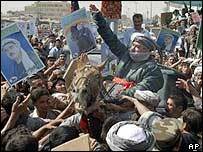 Mr Qanuni also accused Mr Karzai of intimidating his supporters. "They threw our supporters into jails. We condemn this act and we ask the UN and the government to release those people who have been sent to jails for no reason but supporting us." General Dostum's rally drew thousands in the northern town of Mazar-e-Sharif. Crowds of men singing and chanting filled the city centre. Others packed into trucks, driving through town waving photos of General Dostum and shouting at bystanders to use their vote. Our correspondent in Mazar, Monica Whitlock, says the general, an Uzbek, is very much a northern, not a national figure. She says to lose here would be disastrous for his credibility but securing a sizeable vote would give him political credentials and perhaps a voice in the country as a whole. Campaigning ends on Wednesday, ahead of Saturday's election. The registration of refugee voters in Iran and Pakistan is now complete. A four-day drive in Pakistan ended on Monday with the organisers, the International Organisation for Migration, saying around 740,000 refugees there could now vote on Saturday. Up to 600,000 may vote in Iran. "We are happy with the total," said Belquis Ahmadi, senior Afghan adviser to the IOM. "We are also happy that no major security incident happened." Security in Afghanistan itself remains a massive concern in the run-up to the election. On Monday, Afghan security forces raided a Taleban hideout in southern Oruzgan province, killing seven suspected insurgents in a three-hour gun battle, Afghan officials said. Provincial chief of police, Matiullah Khan, said the insurgents had earlier attacked a police checkpoint about 40km from Tarin Kowt. Five insurgents were arrested in the raid. There were no casualties in the Afghan forces, Mr Khan said. Taleban violence and threats against candidates and voters have hampered the election campaign in many parts of the country, especially the south and east. Twelve people were killed in election-related violence over the nine-month registration campaign. Hundreds have died in militant attacks in the last year.